Sally Cruikshank is an American cartoonist and animator. 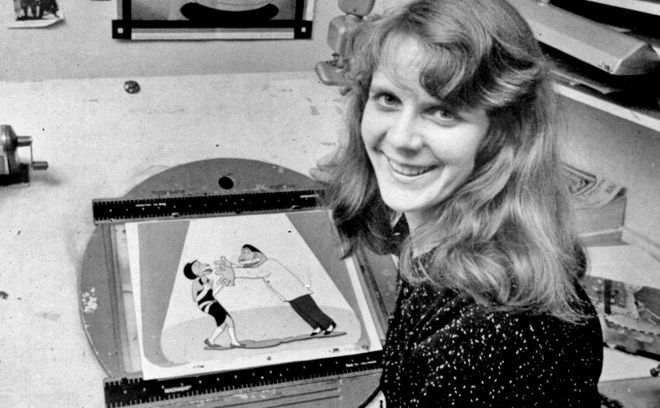 Sally's work includes the 1975 short film Quasi at the Quackadero, 1978's Make Me Psychic, and 1987's Face Like a Frog, featuring music by Danny Elfman. She has created the opening title sequences to films Ruthless People, Mannequin, Loverboy, Madhouse, and Smiley Face, and animated and produced many music videos and animations for children's television show Sesame Street from 1989-1999. In 2009, Quasi at the Quackadero was inducted into the United States National Film Registry, and in October 2012, several 35mm prints of Sally's work were screened at the Museum of Modern Art in New York. Sally is also featured in our 10 Women of Title Design article.